Ian Purves is a passionate outdoors person and photographer. He has also been a leading medical academic, a successful entrepreneur and is now a medical doctor for the Ju/’hoansi San Bushmen at the N/a’an ku sê Lifeline Clinic in Namibian Kalahari Desert. Ian has always mixed his outdoor activities with photography but it wasn’t until 1983 he invested in a SLR, a Pentax ME Super, a few lenses plus boxes of E-6 transparency film and Ilford HP4 400 before going to work in the Central Highlands of Papua New Guinea. Film SLRs have come and gone but it has been in the digital era that Ian’s self-taught skills have been refined and his passion, if possible, increased. 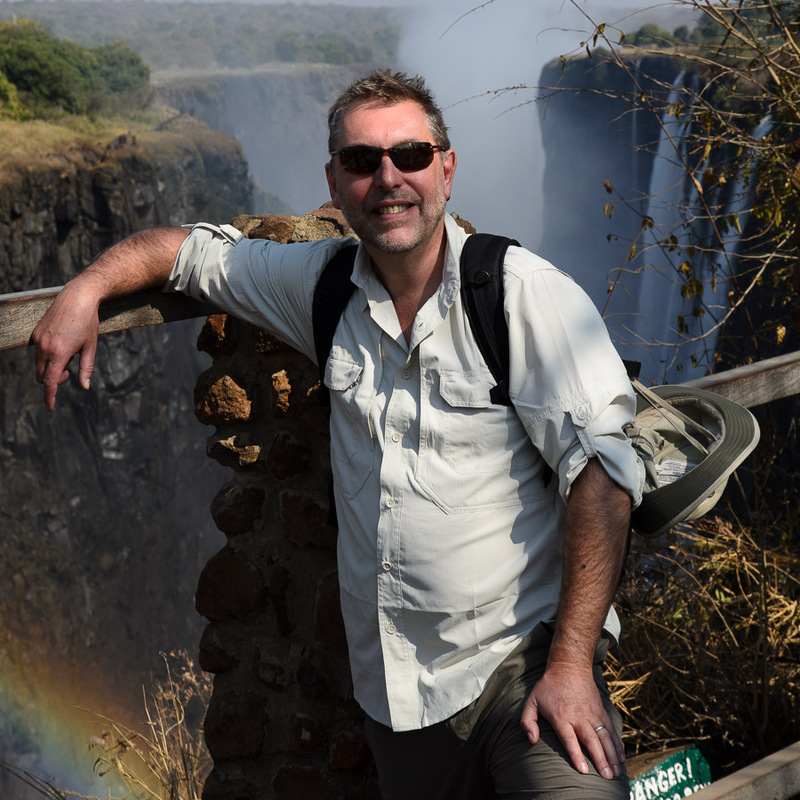 Moving rapidly through the Nikon digital SLRs Ian now uses two D800′s and whilst he has always been a Landscape and Travel photographer he has after 5 weeks in Africa in 2012 is slowly developing a wildlife skill set. My photographic ethos is to create images that grab your attention and confer meaning and wonder at nature. In landscape photography he enjoys mountain and seascapes with high contrast weather or in the golden hours, in travel he enjoys capturing people at work and play and in his new interest of wildlife photography he says he is not ‘composed’ enough in himself yet to think he has a style. Starting sailing off Vancouver in the mid 90’s Ian sailing skill has been refined – he is now a RYA Ocean Yachtmaster with thousands of Ocean miles. Ian loves cruising but enjoys racing and has successfully skippered all over the world from Cowes Week, Antigua Racing Week, and so forth, in mono and mulithulls but also in a 1934 staysail schooner in the Rada Muda off Malasia. Ian’s wife Sharon is a born sailor and racer – they have enjoyed many trips. Graduating in Medicine in 1985 from Newcastle Ian’s medical career was in General Practice he shifted into an academic career in Vancouver at UBC and then was Visiting Professor of General Practice, University of Otago in New Zealand. On returning to England he became Professor of Health Informatics at Newcastle University. In 2000 he took his Research Centre into the commercial world which has become the Clarity Informatics Group with 60 staff and a turnover of £4-5 million / year. Along the way Ian has been an advisor to many governments, including one of 20 Expert advisors to the European Union on the Information Society and is a Fellow of the Royal College of General Practitioners. Ian’s skills are a mix of behaviour change and educational philosophy, evidence based medicine and computer science – he has a Doctorate in computerised decision support. Ian is a keen skier, fell walker and mountaineer and has recently done the Haute Route in the Alps, he has also been a qualified diver from 1978 and seen many changes in gear and safety. He and his wife take at least one holiday a year cycle touring and they enjoy their Koga Signature’s with Rohloff hubs. Stop Press: He has just had a bespoke Expedition Landrover Defender 110 300TDi shipped to Namibia and almost certainly will bore you about this! Living in the centre of Newcastle-upon-Tyne Ian is married to Sharon and between them they have five children. Ian currently uses Nikon digital equipment. Most of the gear is discussed in his blog. hi There, found your website by chance when trying to find out about Purves name . I am Sarah Purves We live in auckland New Zealand, and i am married to Ian Purves my husband whom i met in london. My husband parents are John and Sheila Purves, .Johns Ian father is from edinburgh originally. Johns father was William purves and he was a gardener for the duke of westminster for many years. your info about the purves name is really interesting and i will share it with the family. My husband has two uncles onewho lives in edinburgh still called William purves and one called Robert (bob)purves in london. Not sure when u will read this, On august 15th 2014 I will yet again be in scotland, Greenlaw, (the Boarders), I have been searching these past 10-12 years undertaking extensive research into my family history. My Grt Grt Grt Grt give or take, the Rev James Gilliland, Greenlaw), Married the daughter of the then Sir Alexander Purvis in 1719, both used Gilliland-(Purvis). The Rev James Gilliland’s father was a Lord,. there are Earls in the family. It would be good to exchange some detail as there are some gaps in the period around 1724 and onwards as to what took place in the Edinburgh Courts once Sir. Alexander Purvis died, as he was in debt,. The Holm/Hume family, were appointed to oversee the estate whilst he was alive, so what happened? I am lead to believe that upon his death, his creditors demanded payment or they took property/land and titles. (most went to the Hume family), when the Rev Gilliland-(purvis), died unexpectedly and under very suspicious circumstance, his now widow married into the Hume family?. I have documents confirming some of this, but it does not answer a lot of questions. I too am a descendant of James Gilliland and know nothing of him prior to his marriage to Marjory Purves. Any information you could provide would be most appreciated.